This page is to provide information, updates and directions for our staff, students and parents pertaining to the safety of everyone in our parking lots, sidewalks and streets surrounding South Middle School. Thanks for giving it your attention. Students who walk to South MS may enter either main entrance after 7:30am. A teacher will be on crossing guard duty at our entrance and LA Grant to help students cross the busy LA Grant before (7:35-7:50a) and after school (3:00-3:10p). Students should use the crossing lights/signals and be alert to “unaware” drivers at the corner of LA Grant and Westown Parkway. ALL walkers heading north should stay on the east side of LA Grant until you get to the traffic light at Westown Parkway. If a student is crossing LA Grant out of our parking lot to head home, he/she MUST wait until an adult is at the crosswalk and the flashing light is pushed. Students arrive and are load the buses in the NE lot of South MS and use the east main doors to enter in the morning. Students should get items from their locker, secure their band instrument as needed and report quickly to buses after the last bell of the day. Tip 1 – Doors do not open nor do we have supervision until 7:35am each morning. We have supervision at the crosswalks from 7:35-7:55am. Please have your walking/biking/drop off plan accordingly. Tip 2 – Drop off and pick up cars pull all the way to end of the “U” loop (top thick yellow line below) to drop off. Even when traffic is light. 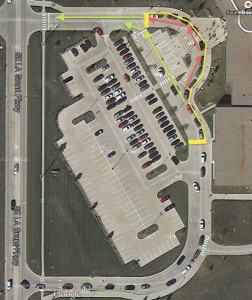 Tip 3 – Students can exit or get in their vehicle any location where the curb is painted yellow in the drop off line. This starts clear back by the music room doors (bottom thick yellow line below). Tip 4 – One lane of drop off. DO NOT drop off in parking lot! 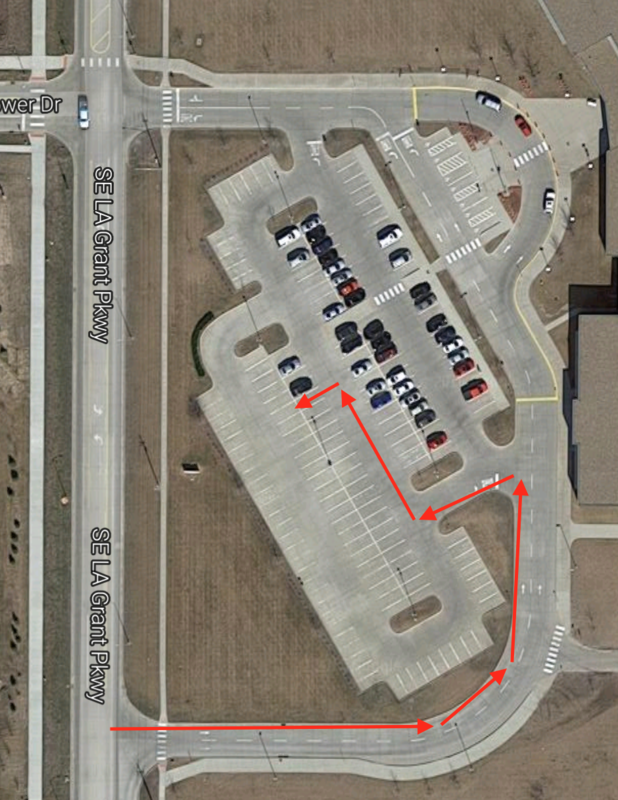 PLEASE NOTE: Green arrow – parents who have dropped students off may continue straight instead of going through loop. We want parents to be aware of the two vehicle options to pick up students. Parents can wait in the RIGHT lane of parent pick-up OR parents can use the LEFT lane to enter from LA Grant and then pull into the parking lot. This 2nd option is very helpful to our flow of traffic when the line is backed up to LA Grant!! Parents must park their vehicles and students can use the crosswalks to move from the building to the parking lot. Tip 2 – Parents/pick up vehicles cannot “troll” in parking lot (pink circle in picture) or pick up students in the pass-through lane (pink circle by green arrow). For the later, you will be asked to exit and have to go out onto LA Grant before re-entering our parking lot. Traffic Flow and Parking: The Timberline Website now contains links and tabs related to traffic flow and student parking. 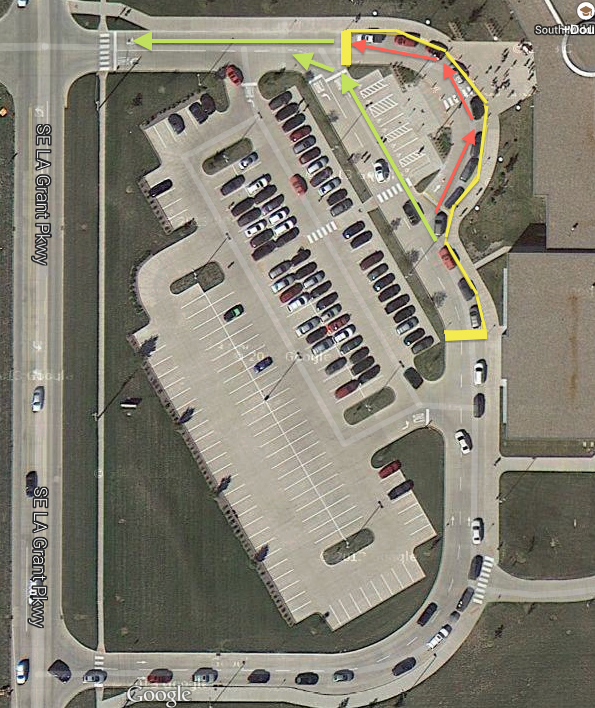 Traffic flow for drop off and pick up will be very similar to the flow at South Middle School last year. We will want cars to remain in single file lines as they exit LA Grant Pkwy into the Timberline driving lanes so that we don’t have students crossing in front of moving traffic. We are attempting to add additional signage to our lots and driveways prior to Monday morning. With or without additional signage, we ask that all drivers be cautious, safe and patient in order to ensure the safety of students, staff and parents. The city of Waukee let me know their plans for lights, new sidewalk/trail and replacement of sidewalk torn out will all be complete by Monday, August 24. Students should be able to walk to and from school safely! We will be communicating with Timberline students who will be walking home from Timberline to the neighborhoods to the east and northeast of South MS. Our expectation is TL students cross at the new light on LA Grant and Westown Parkway and do so in groups. This will help the traffic and bus flow in and out of South at the end of the day. 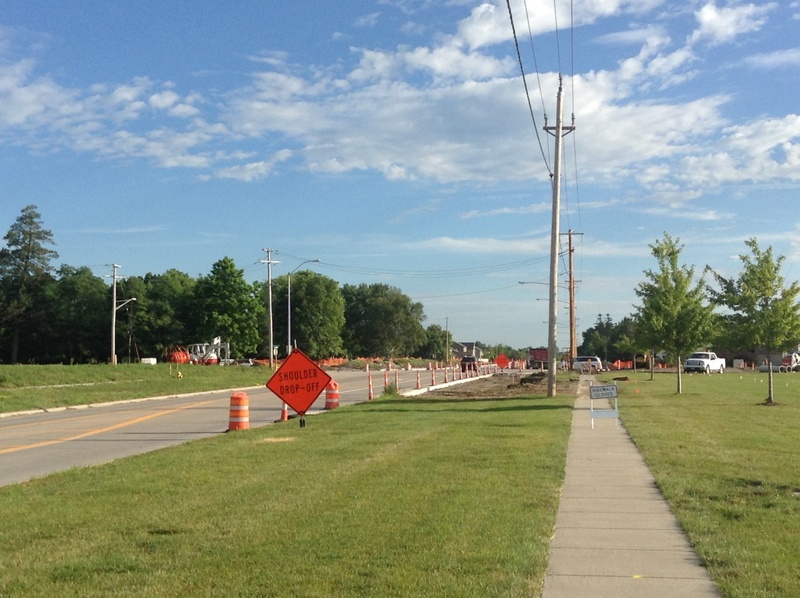 The construction on LA Grant and Westown Parkway is progressing. Turning lanes are almost done in all four corners and it appears the stop lights will be installed early to mid August. 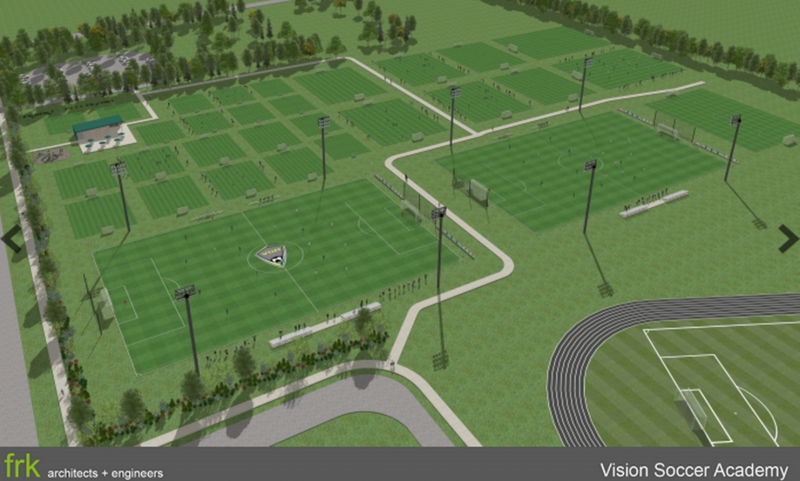 I have also been told that the new VSA soccer complex south of Timberline should be in use by mid August as well. This nearly 20 acres of green space will be home to over 30 soccer fields and was made possible through a sharing agreement with Waukee CSD and VSA. Why is this information on our “Traffic” page? With the addition of Timberline and the VSA complex, on LA Grant, we know it may bring some traffic issues to work out so for now, stay patient…but we hope to continue to update families in order to make this great stretch of road a safe and exciting place to be! Looking north from SMS toward LA Grant & Westown intersection. VSA Complex just south of the new Timberline Building. Opening is scheduled for mid August. a traffic light on Westown Parkway and LA Grant Parkway. a sidewalk on the westside of LA Grant that would connect the sidewalk currently ending at SE Telby all the way to Ashworth (past the soon-to-be built APEX/CAPS Waukee Schools building). a temporary stoplight at LA Grant and Ashworth with a permanent stoplight going in sometime over the next year. Students will be able to walk/bike to school from the neighborhoods to the north and west of LA Grant/Westown Pkwy intersection safely by using the crosswalks at the newly erected stoplight. I understand dropping your child off at school in the morning can be a test of patience. We need every parent, grandparent or older sibling to follow our drop off procedures in order to keep our students safe. If you have someone other than you drop your child off, please give them this information. Please follow the procedures located on our blog: http://blogs.waukeeschools.org/dbarry/traffic/ . It is important to pull all the way up to the last sign in the loop. Don’t worry – your child can walk safely from this spot and if its raining, they won’t melt. 🙂 This helps traffic move more quickly since more children can unload at one time. drop your child(ren) off in the handicap spots. You will be asked to keep driving. form a 2nd lane in the “loop” near the doors to drop students off more quickly. drop students off in the parking lot. form a line in the parking lot during pick-up times. Vehicles must be parked in a parking spot before your child gets in the vehicle with you. If everyone follows the rules in place, we create a safe environment for students and we will see more smiles from all of you. August 13, 2014 Update LA Grant is open! LA Grant should open up this afternoon to north and south bound traffic. DOH! …it won’t be open tonight. Sorry! 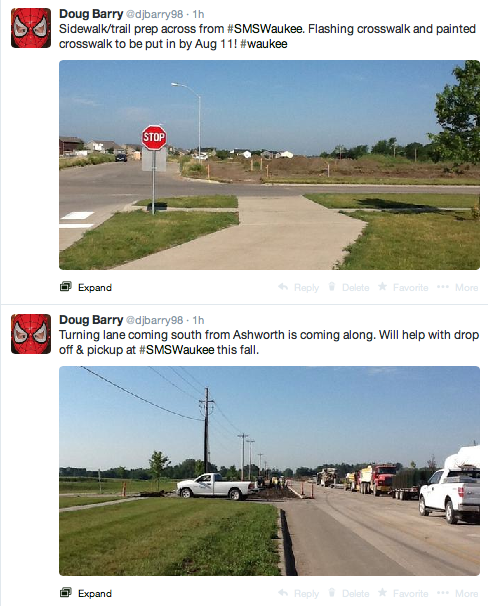 Instead, City of Waukee officials said it will be open Wednesday morning for the first day of school. LA Grant is still closed to through traffic. As of now, visitors will need to enter the parking lot through the “exit.” We won’t ticket you this week. 🙂 We were told LA Grant would be ready to go by next Monday, August 11th. With Open House that night, we hope they are right. The sidewalk west of the school is almost complete. A flashing cross-walk light will be installed this month and our hope is it is ready to go on the first day of school. Please know University will continue to be one lane up until November/December. The work on SE LA Grant Parkway continues! After meeting with Waukee city officials earlier this week, we believe LA Grant will be open from SMS to Ashworth by August 11th (Open House night!). If there are delays, we will notify parents. I have included some pictures of the added sidewalk/trail to the west of us and the new turning lane on LA Grant to allow our traffic from the south to turn into our parking lot without holding up northbound traffic. Parents can also view the City of Waukee’s plans and timelines here. We have extended our drop-off zone to the band-door entrance to allow for more students to exit vehicles in the morning. During pick-up ONLY, we will also allow parents to park in the front row of the parking lot this year and students will be able to walk to those vehicles upon dismissal. Walkers – All walkers will exit the front doors even if you live to the east or northeast of SMS. We do this to help kids be safe by not walking through the bus loading zone.